A few summers ago, I was sitting along the Nagwichoonjik (Mackenzie River) at my family’s fish camp. I had hauled nearly fifty pounds of books with me – to, arguably, one of the most remote places in Canada – to continue reading for my PhD comprehensive exams. The presence of these academic monographs at an ancient Gwich’in fishing camp sparked new and intense conversations with my camp colleagues and passers-by. Debates about how to undertake ethical research, to be both Indigenous and an academic, and the politics of land coalesced over those ten days. This experience confirmed something I had long suspected: for Indigenous people, academic research is tenuous. More than ‘just another project,’ larger than simply a ‘job,’ and far greater than the working hours that confine us to our offices, our research penetrates almost all aspects of our lives. Indigenous people are so intimately connected to what we study, because we are continually trying to improve our very existence. Scoffing at the concept of “objectivity” – a favourite among historians – we are incapable of undertaking ‘apolitical’ projects because the political is always present. Treaties. Missing and Murdered Indigenous Women. Clean drinking water. Forced sterilizations. Hunting rights. Cultural appropriation. Stereotypes. The Indian Act. First Nation, Métis, or Inuit: Indigenous people in Canada are connected the settler-nation state and consistently question how this state attempted and continues to attempt to legislate, oppress, and categorize us. 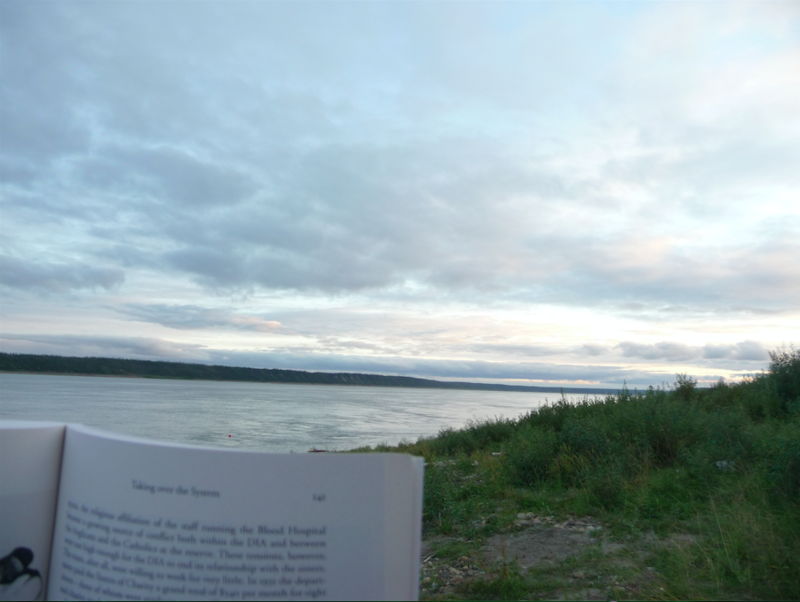 Reading for PhD Comprehensive Exams at Diighe’tr’aajil, Northwest Territories, with the Nagwichoonjik in the background. Photo Credit: Crystal Fraser. This ActiveHistory series demonstrates the commitment that Indigenous people make to academia, our communities, and our families. Although we engage in these debates for different reasons, we are united by highly intimate and personal processes that guide each of us. Here, contributions are made by Inuit, Métis, Dakota, Dene, Cree, Anishinaabe, Ojibwe, Lunaape, and Tutchone scholars spanning from the University of Hawai’i at Manoa across the western plains into central Canada to Carleton University. Indigenous Studies scholar Leanne Betasamosake Simpson begins our week with her provocative post entitled, “A Smudgier Dispossession is Still Dispossession” and UWinnipeg historian Mary Jane McCallum offers her final thoughts to close the week. Eight other posts are written by Indigenous graduate students and early career scholars, demonstrating the vibrancy and path-breaking direction of Indigenous research in Canada. Our Indigenous histories, worldviews, and approaches are sometimes exceedingly different, but shed light on the fraught and immensely important nature of Indigenous research in Canada. Tackling the persistence of widespread stereotypes, highly personalized experiences, nation-to-nation relationships, contemporary dilemmas that will affect future generations, as well as vital concerns about how we teach our disciplines, and the role of Indigenous people in that process are the some of the themes you will read this week. This Indigenous History week at ActiveHistory has been an unfolding process over the last several months. With the goal of incorporating a greater level of diversity and perhaps broadening readership beyond a settler-Canadian audience, I took on the role of guest editor for the week to invite contributors, work with them to develop posts based on their interests, and coordinate this series. All of these authors were very happy to share their research and contribute to the conversation, but we also had ongoing (and persisting) conversations about difficult topics. What are the implications of sharing our research? How can we convey to readers that these are not ‘controversial issues’, but our lived experiences? What role should my own community play in my research? Where do I, as an Indigenous person, fit into academia – a system built and maintained on white privilege and settler colonialism? As the posts unfold over this week, I encourage ActiveHistory readers to embrace them with an open heart and an open mind. As a way to engage and further the conversation with each other, we will be tweeting under #AHindigenous. I’m looking forward to reading this series. Thanks for editing this, Crystal!